This got me thinking about the immune system and how to strengthen it. Greens provide vast amounts of nutrition and help to strengthen the immune system. Unfortunately, my kids aren't keen on nibbling rabbit food... so, I googled "green drink recipe for kids" and it came up with Dr. Oz's (as seen on Oprah) Green Drink Recipe. I tossed the ingredients in a blender, added a handful of ice cubes, then pureed quickly for one minute. Well, unfortunately, she took one sip, said "Mmmmm!!" and then she was done. Yep, one sip. And the, "Mmmmmm!" must have been just to make me feel good. What a nice little girl. So, with all the delicious green puree still sitting in the blender, I got an "ah-ha!' moment and filled my popsicle molds up and threw them in the freezer! Guess what? She likes green popsicles! Yaaaaaay! What about you?? 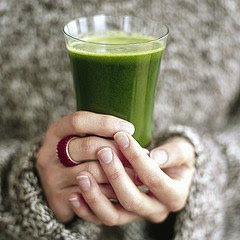 Do you have a great green drink recipe you would like to share? How do you help strengthen your kid's immune systems? And for Heaven's sake...how do you get your kids to eat their greens?! !